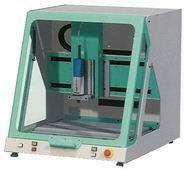 A numerical command 4-axis milling machine for insoles, orthotics and lasts. This unit is capable of milling or digitising 1 last and milling 10 pairs of insoles, all on the same machine. A numerical command 3-axis milling machine that allows the milling of 1 pair of lasts at a time. (Optional: 2 different lasts at the same time.) The option of digitising is also available. A numerical command 3-axis milling machine that allows the milling of 1 pair of lasts at a time. (Optional: 2 different lasts at the same time.) With a separate rotating axis for digitising. A numerical command 3-axis milling machine that allows the milling of 2 pairs of lasts at a time. The option of digitising is also available on this unit. A full size production milling machine that can mill 4 to 16 pairs of full size insoles on its 500 mm x 720 mm until 1520 mm x 1020 mm working zone depending of optins. It is fully equiped with a 2.5 kw spindle, an iso 25 automatic tool changer (6 tools), a vacuum table and a retractable dust collector. Ideal for fast milling or hard plastic and mould milling. Can be equiped with a rotary axis for last milling. A table top numerical command 3 axis milling machine that can mill up to 4 pairs of orthotics on its 600x600 mm milling area. This machine exists in stepping motors or brusless servo motor version, with or without automatic tool changer. A numerical command 3-axis tabletop milling machine for lasts. This is a table top machine with external cabinet dimensions of (lxwxh) 1005 x 690 x 400 mm which weighs approximately 250 kg. 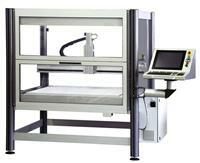 A numerical command 3-axis tabletop milling and digitisation machine for lasts. This is a table top machine with external cabinet dimensions of (lxwxh) 1005 x 690 x 400 mm which weights approximately 250 kg. The MiniSole CPV is a 3 axis table top servo motor program operated milling machine suitable for milling foot orthotics in a range of materials including low and high density EVAs, PU, and others. Negatives can also be milled in materials such as MDF. Average milling time is +/-15 minutes per pair. A table top milling machine for lasts. A still small but very productive NC milling machine with top of the line spindle and automatic tool changer. Ideal for hard material or moulds. Can mill in batches of 2 pairs.